Our last four weeks of striper fishing on Lake Texoma has been outstanding. 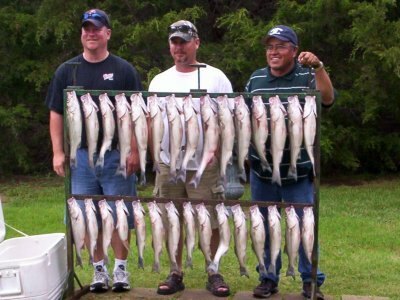 I have spoken with guides who have fished Lake Texoma for twenty years and more and they all agree that the fishing has been the best they have ever seen. Limits of good 17 to 24 inch and larger fish have been the norm. Catching a limit of these fish in a very short time has also been the norm. Live bait has been the key to a good day fishing this spring. We are still finding our fish in the deeper waters which should continue through the month of June. Although live shad is the key to catching a limit of good sized stripers, it is also getting hard to find good schools of shad to fish with. Look for the Egrets, white birds, near the shoreline for a good indication the bait fish is nearby. The further into June we should start to see the topwater action really pick up. The large schools of stripers will run the bait fish to the surface and they will be in a feeding frenzy so make sure you have an extra rod with a topwater lure tied on and a good supply of Sassy Shads or Coho Minnows. The pool elevation of the lake is still around 620 feet above sea level and the Corps of Engineers have the Dam flood gates open in the 27,00 cubic feet per second range. With all this rain we have had the lake has risen, gone down some then come back up. Be extremely careful when launching your boat. A lot of the boat ramps are under water and it is very easy to back off the side of the ramp, which will definitely ruin your day, If you have a buddy with you, have them guide you back down the ramp, it is always better to be on the safe side. A lot of the camp grounds are also under water so do your homework and check out the area you plan on boating and make your trip on Lake Texoma a safe beautiful day.